By default, Projects, Lists, and tasks will be “public” - meaning they're shared with anyone that has access to where they live. All "public" items inherit privacy from their parent. - Optional: Share with users on your team or invite guests! 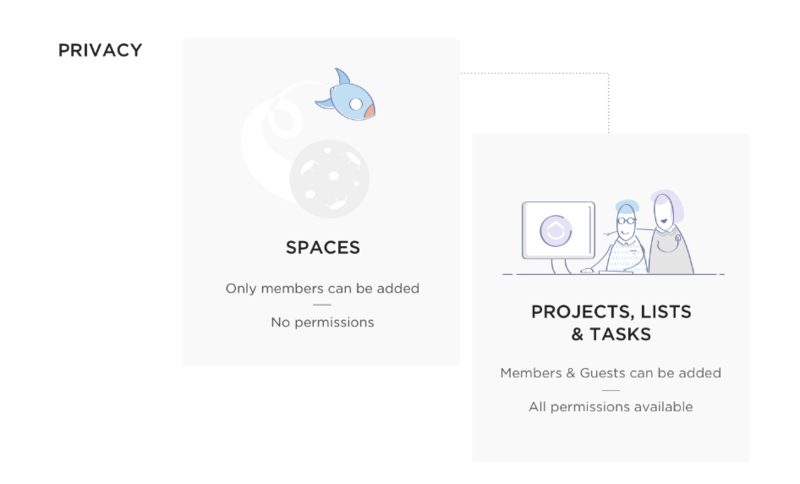 Members on your team can make anything they have access to private (or public). Admins can hide things such as Time Estimates, Time Tracked, or Custom Fields so Guests can't see them. Members with Can create and edit (full access) to your Project will be able to edit Project settings such as Custom Fields or Custom Statuses. Guests on Free Forever teams will only be granted Create and edit permissions. Looking for Space level privacy? Read more here. For more details, check out our FAQ doc here.